INDUSTRY.co.id - Jakarta - Honor launches smartphones at affordable prices Honor 7A is designed specifically for users who need excitement and ease in everyday use. The launch of Honor 7A proves Honor's commitment to continue providing smart phone choices for Indonesians, including smartphones with advanced features like dual cameras and Face Unlock. "As an innovative trend-setter brand, Honor is dedicated to bringing unparalleled high value products to all levels of our consumers in Indonesia," said James Yang, Honor Indonesia President in Jakarta, Monday (4/6/2018). The launch of this product while offering the experience of using an upscale smartphone feature at an affordable price for everyone. Honor 7A comes with a Face Unlock feature that ensures ease of use, a high resolution high resolution rear camera that delivers high quality picture shots, and a large FullView Display screen. All these excellent features perfectly integrated in a sleek body that is offered at a very affordable price, which is Rp. 1.899.000. The presence of Honor 7A gives customers more choice for smart phones that fit their needs with competitive yet high value prices. Honor 7A will be available in black and blue and will be sold exclusively at Shopee at 12.00 WIB, Thursday, June 7, 2018. "Honor is proud to present one more competitive product, Honor 7A, to our partners and fans community. This new smart phone features advanced features such as Face Unlock, dual camera and FullView display with a very affordable price. We are confident that Honor 7A will earn a place in the hearts of the youthful users, "added James Yang. Meanwhile, Shopee Indonesia Director Christin Djuarto said, Shopee and Honor have started this cooperation since the beginning of the launch of Honor in Indonesia. The success of Honor 9 Lite is a good start from the cooperation of both companies. "Therefore, we will continue to provide a variety of options for users while strengthening Shopee's position in the electronic category. We believe Honor 7A with its superiority can answer millennial needs and gadget lovers will be high-quality smart phones in Indonesia. For that, we believe Honor 7A will well received by the people of Indonesia, "said Christin. 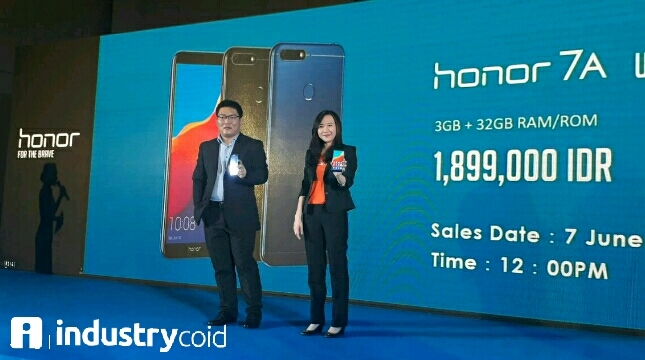 Since Honor first established its steps in Indonesia in March 2018, the e-brand of this smartphone has shown remarkable performance in the market. In April, Honor broke Shopee's record by selling the most units in the first minute when smart phone flash sales. This shows an effective sales strategy Honor in collaboration with e-commerce services by "fetching" buyers proactively rather than using traditional sales forces. In China alone, Honor is the number one smart phone e-brand in 2017 in terms of sales. Sales increased significantly on Black Friday last year in the United States and Europe. Meanwhile, Honor also achieved a similar success in Russia as the third largest brand in market share.